Chris Califano Crushes "Nutrition" Myths! I never believed it would be possible. And all those "natural doctors" and "experts" in my community all tried to discourage me. "You need to get your PROTEIN...and take our pills, powders and potions"! They were clueless! I can not believe that those who call themselves "doctors" or "nutritionists" are not aware of TRUE HEALING AND GENUINE NUTRITION. It really makes me angry and sad...so many people could be helped. Instead they are misguided with false promises and "woo woo healthy" dogma. 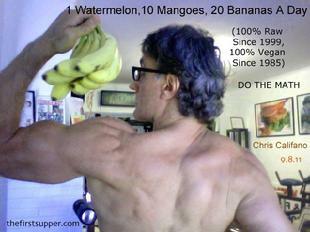 "Vegan since 1985, raw since 1999, primarily fruitarian. I discovered the fundamentals of human nutrition in the seventies. The only diet fit for humans is raw vegan, mostly fruit. Those who do not benefit are simply not eating properly- they need guidance. Trial and error with myself and countless others in The Best Weigh Center For Ultimate Health; a combination human performance training facility and teaching kitchen of my own design has proved this. I promote no supplements, no "super-foods" and no gimmicky "treatments". True health comes from obeying nature's design principles. Many fumble towards health, never following these fundamental laws to the point of reaching what can only be called paradise health and fitness potential. For the last 30 years it has been my "duty" to chronicle, teach, and share my own simplified Best Weigh program of food and fitness with those who are ready to stop wasting time on pop-culture "wellness", "naturopathy", "health food store nutrition" and all the rest of the pseudo "arguments" engaged in by well-promoted "natural experts" who promote everything OTHER than fundamentals that always work for everyone permanently. There are several raw food gurus, authors, raw restaurant owners and lecturers who have "jumped ship" and are trying to convince people that eating a 100% raw food diet, especially one high in fruit, is not only "difficult" but can "lessen your enjoyment of life" and that eating enough cooked food to satisfy your calorie needs is "healthy". This LAMENT OF THE UNINITIATED has caused some "controversy" in the raw food community. Discover the solution here. This is the small me. I have not even trained hard or heavy for the last five years! Stay tuned at my blogs and I will show you what happens when a person with "non-bodybuilder" genetics (poor leverages ,thin gangly limbs and a weak lower back and neck) actually eats the best way and trains the best way." When I "went raw" I lost even more weight than when I "went vegan" long before The China Study was even published. I don't make judgements on diets until I have experienced them for decades, and then put my clients on them and get the same results over and over. As exciting as it is to build muscle (super athlete endurance is soooo easy to achieve!!!!!) on a 100% raw diet FREE FROM SUPPLEMENTS, it is old hat now for me. At age 51 and after 33 years in the fitness and nutrition industry, things that seem to baffle doctors, nutritionists and trainers are super clear to those who have "walked the walk". 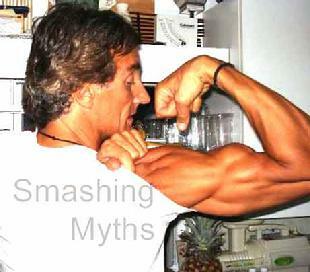 "I never tried to be a bodybuilder"
More size is not synonymous with more health. Most messages and challenges to what is the natural diet for humans is one of the biggest "controversies" of this millennium. There are no controversies in nature or genuine science... 99% of researchers are guided by their own food habits, addictions and disorders. Since the start of the modern "wellness and fitness revolution' over fifty years ago, it has been firmly established and agreed upon that genuine health can not be faked. Once the blood is tested, the most fool-proof method for proving physical health remains to be to test their strength, cardiovascular endurance, flexibility and most of all when it comes to raw vegan, their body composition. The ability of the body to actually create healthy tissue on nothing but pure food, rest and exercise is the gold standard of proving health and wellness. Solid proof comes from experience. "The HUGE SECRET is pure food, rest and efficient exercise"
This arm development comes from pushing and pulling movements, not direct arm work like "curls" or "triceps presses". I leanred that the "exercises" most people do in gyms are a waste of time for the busy raw food teacher and trainer, and they eventually cause injuries too. Stick with the fundamental lifts, especially if you have long gangly-boned weak genetics like me. At one time my elbow joints were larger than my actual arm muscles! "I never avoid cardiovascular exercise; I just discovered 30 years ago that you only need twelve minutes in your target heart zone two or three times per week to obtain a training effect that rivals most athletes. Going vegan and then raw showed me that DIET not exercise is by far the biggest factor in your heart, lung, vascular as well as local-muscle endurance. I have never been one to "eat soup with a fork" so I created a food and fitness program that took advantage of the proven fundamentals of human performance and nutrition and thus save myself and others about 75% of wasted energy, compared with the way most people exercise. No wonder most people do not enjoy exercise! Of course, nobody ever did not enjoy even a long, exhausting yet invigorating workout, but I know that they would love to get 300% better results in a third of the time if they wanted". Ultimate size and ultimate health are at opposite ends. When I was as big as my genetics would allow me to get (without steroids of course, as health-building was always part of my strength goals), and on a vegan diet, I only weighed 212 pounds with a 32 inch waist at six feet. I was only able to barbell squat 325 to below parallel (225 for 25 reps). After being raw for a decade I enjoyed enormously improved health and endurance of course, but found that in order to gain excess weight I had to force feed again, which caused me to get sick each time my body decided it was time to eliminate the excess matter. This is a fundamental process that few realize happens. Most think that they are just "feeling under the weather" when in fact it is testimony to the fact that conservation is basic law for humans too. Unless one is born with favorable genetics including normal (not gangly) stature, then one is going to have work twice as hard if not harder to achieve what the shorter, more mesomorphic person can attain with relative ease. I know. I have been there for 33 years and have also trained countless others, drug-free in that time. CANCER MYTH B12 SUPPLEMENT MYTH COLD & FLU MYTH WEIGHT LOSS OR GAIN MAX MANGO!